Yesterday, Bob Lussier had a post called “Off Centered” in which he confessed that he needs to better check his framing in the field, because the shot he posted came out off centered. I commiserated, and promptly fell for my biggest in-the-field compositional mistake, which is a tilted horizon. In my (partial) defense, I will note that if you look at the line where the sidewalk meets the building, it is only slightly off, but lens distortion really amplifies it the higher you look. I decided to leave it as is as a bit of a tribute to Bob, who had a birthday recently and is running the Boston Marathon today. I spent a couple of hours shooting in the neighborhood of Ridgewood, Queens, yesterday, most of it under a spur of the elevated M Train line as it makes its way to its end point in my neighborhood of Middle Village. Those are shadows from the “el” in the foreground. I haven’t shot in mid-afternoon for a long time, and as much as I love the wonderful light I get at dawn, this was a refreshing change. This section of the elevated is unusual. It veers off Myrtle Avenue a few yards from this spot, to run above Palmetto Street for a few blocks, and then it does something I have not seen in any other elevated. Instead of running above a street, it cuts right through the middle of several blocks above a series of back alleys. It is following an old street level train and trolley path. I’ll take you up the entire route over a series of posts. 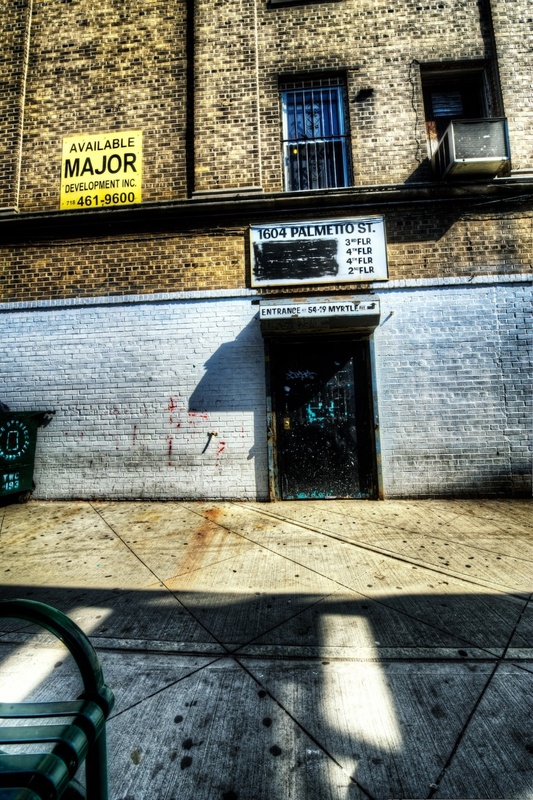 The current Google Maps street view image for this spot shows that there was a spray painted sign for Richie’s gym on the wall to the left of the door. I believe the gym is still there, so I suppose they were just forced to paint over the sign, although the real estate sign might indicate that I’m wrong about it still being open. Finally, my shooting day ended with a pleasant enough encounter with a couple of police officers. After I was back in Middle Village, I stopped to shoot from a bridge over a freight train line next to a cemetery. A bridge, railroad tracks, and a tripod. Any of my photographer friends can do the math. But as I said, the encounter was pleasant enough. The officers were professional and doing their job. We chatted, and I showed them some of my portfolio on my iPhone. It was clear that they understood what the limits of the encounter were, and that I was not violating any laws or regulations. I also tried to explain the fascination photographers have with light, shadow, and perspective which makes train lines and bridges such catnip for us, although I’m not sure I was very effective. I did give the officers my card, so they might even stop by to visit here – If so, hello and welcome. Maybe the series of photos I will publish from under the M Train in Ridgewood will explain it better than I could with words. If I could add one thought, it would be this. Even as I acknowledge that I’m no expert on catching terrorists and bomb planters, I do know photographers and photography. And you wouldn’t need a tripod for sabotage surveillance or to plan anything nefarious. Indeed, a tripod just draws attention, which anybody with foul motives wouldn’t want. A small hand held camera or video recorder little bigger than a point and shoot could capture and record everything someone like that needed without drawing attention. Officers, if you see someone using a tripod, I believe there is every likelihood that they are, like me, just taking pictures for art or for fun. Finally, a notice: anybody posting nasty comments about police and photographers, or calling this encounter harassment, will have the comment deleted. As I said, these officers knew their stuff and acted appropriately. No need to be rude. I can’t agree more with train track being like catnip. I’m constantly noting tracks and what is on them for future trips. I hope you do post a series on it, as I would love to see them. Glad to finally hear a nice cop story as well! Great post and great story Mark. It’s always nice to hear about positive encounters with the authorities for a change. I have the same trouble keeping my horizons straight, I finally had to buy one of those level cubes to help out. Nice job! Love this shot, Mark! Especially the addition of the bench! Top notch! Great image, I really like the textures. Really really love the details and textures you’ve pulled out of this scene today, Mark! Great job my friend. I find framing and getting stuff to line up properly is one of my biggest challenges personally as I grow with photography. I love this shot, my friend. Great blog today, too. Glad the cops were cool with it, they were well trained and professional. I’ve heard stories of similar encounters that have gone in a completely different direction. My point being, you can’t make generalizations about the cops, as with any other group in life. It is kind of sad though, that the fear and ignorance of some people has put this country so on edge. Any one who wants to commit an act of terrorism need only pull up Google maps is they want to scout a target, and as other note, the toting of a camera mounted on a tripod is certainly not the clandestine act of a terrorist. nice image and well processed – despite being a bit wonky! Glad the police were okay – I’ve heard may different stories. I’m sure that most are doing their jobs and doing them well, its only the bad encounters that we really hear of. Alignment has always been something that plagues me. I try to get the right things aligned, but sometimes it’s just a processing job away from perfect. Just saw this, Mark. Thanks a lot for the nod and the kind words! I really like the processing on this, and love the subject and light.